Product #21698 | SKU 0407 | 0.0 (no ratings yet) Thanks for your rating! 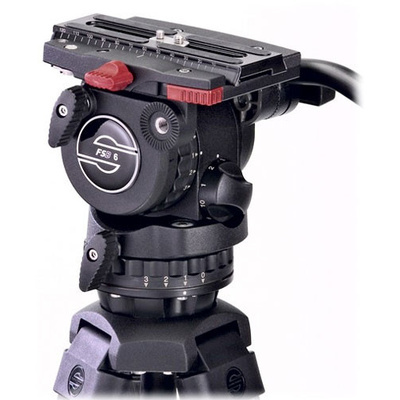 The Sachtler FSB 6 is a fluid head designed to work with the handheld size of DV, DVCAM, HVX, and HDV camcorders. This head is the only in its class to feature Sachtler's Sideload mechanism, which boasts an exceptionally large sliding range of 4.7" (120mm). This ensures extremely fine and fast balancing. The head features 10-step counterbalance adjustment for fine tuning your operating. Frictionless Leak-Proof Fluid Damping Frictionless leak-proof fluid damping with five levels of drag, for perfect pictures while panning, without jerks and vibrations. Identical across both horizontal and vertical planes, and allows complete disengagement of drag for fast panning. The FSB 6 features Sachtler's Sideload mechanism, which boasts an exceptionally large sliding range of 4.7" (120mm). The FSB 6 features the SOOM modular construction system.